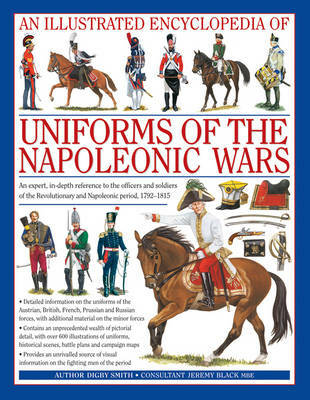 This work contains an unprecedented wealth of over 550 full-colour illustrations, including specially commissioned uniforms, battle plans and campaign maps. It is an expert guide to the weapons, equipment, deployment, tactics and motivation of the national forces of the day, as well as fascinating detail of the day-to-day life of a Napoleonic soldier. It is an unrivalled reference to the insignia, appearance and experience of the fighting men of the period. The book's main focus is the soldiers who fought the historic battles of the day, and the uniforms they wore. It was in this age of war that military uniforms flourished, with an astonishing array of flamboyance, colour and intricate detail. The cut and colour of uniforms were used for identification from afar by the generals directing battles from strategic viewpoints, but at this point in time were also given an extraordinary level of detail in facings, laces and buttons, which carried never-ending intricate differences to denote regiment, rank or division. With over 550 specially commissioned and expert colour artworks, each regiment is vividly portrayed here in all their glory.All the major nations involved in the conflict, France, Britain, Austria, Prussia and Russia, are covered in detail, and there is a section on the uniforms and contributions of the smaller forces, including those from America, Spain, Italy and Saxony.